When economic conditions initially begin to slow down, businesses continue to order goods like they normally would but those goods don’t sell as quickly as they previously did. 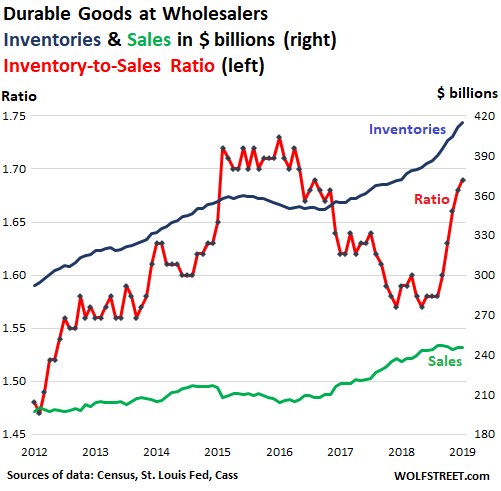 As a result, inventory levels begin to rise, and that is precisely what is happening right now. In fact, the U.S. inventory to sales ratio has risen sharply for five months in a row. This is mirroring the pattern that we witnessed just prior to the financial crisis of 2008, and it is exactly what we would expect to see if a new recession was now beginning. In recent weeks, I have been sharing number after number that indicates that a serious economic slowdown is upon us, and many believe that what is coming will eventually be even worse than what we experienced in 2008.